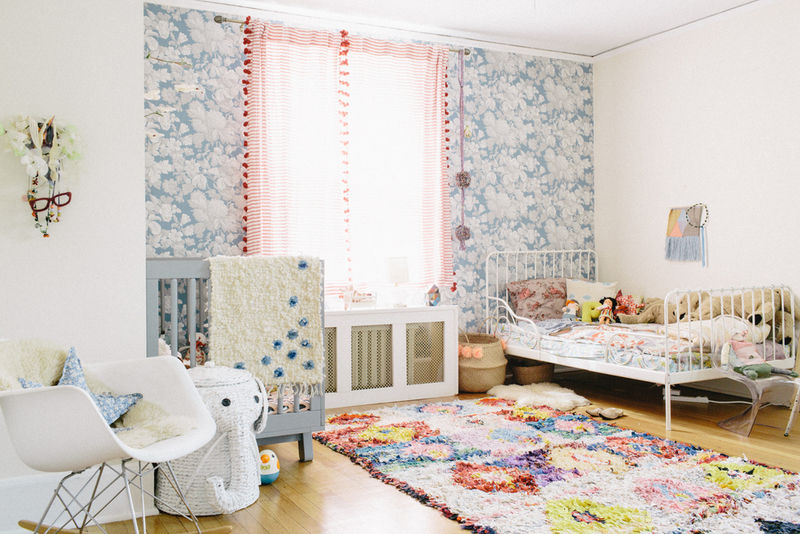 Inside the sweet shared-room of Penelope and Lake! Our very own Ma, Hollie, shows us around her new digs in the Boburbs! photography Jack Jeffries. Beth encouraged me to go with the yesteryear color -pairing of blue and red for a surprisingly girly feel. It reminded me of my own first nursery, a Holly Hobbie theme! Curtains by Anthropologie. Crib Throw by Nouveau Nonchalance. Some of my favorite things here: little girls vintage dress sleeves framed, given to me by my good friend Joanna from Kneeland. Piles of necklaces from my buying days at Anthropologie, and a sweet pillow from BONTON in Paris. becomes unfancy with antique trimmings and a framed photo of my young ballerina mom. Piles of shearlings create a make-shift diaper changer. for the perfect vintage toile wallpaper, but finally settled for this cornflower blue cabbage-rose print. I love the jumbo Moroccan pom poms and the sweet Eliza Gran basket for frothy texture. with a pair of cool little mod chairs. Stuffed w secrets. The beaded is vintage. The bear is knitted by Penelope's Pre-school Teacher. Homemade jewels , salt lamp, + Makie slippers. Help the bedtime routine go a little smoother. Foot candy and tomorrow's school-dress. Stay tuned for more #nursery tours! and send us a note if you have a room in mind to suggest for us! For the first in our NURSERY TOUR SERIES, we step inside our own doors to Penelope and Lake's shared room. The family now lives in Maplewood, NJ (sometimes called "Brooklyn West" for the influx of young families from the borough), a cozy and creative little commuting town. Responding to the old colonial details of the house, Hollie wanted the space to have a bit of pastoral charm: "A mix of white-washed farmhouse antiques with some bright print disruption. I kept thinking about the exotic treasures in the Shirley Temple film, 'A Little Princess'." Click through for more snaps.